Satin silver stand coordinates with any retail or business setting! 75mm x 75mm & 100mm x 100mm VESA compatible for use with interactive tablet, digital signage or TV monitor! Rotating bracket enables users to rotate screen from portrait to landscape orientation, without removing from stand! 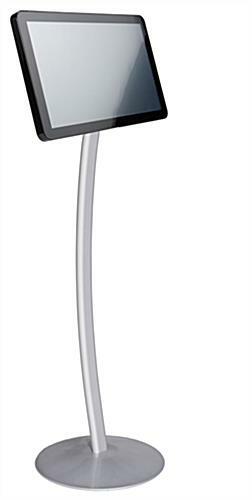 Tilting mount enables interactive tablet to be positioned at ideal angle! 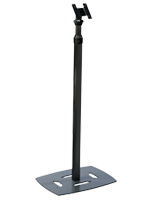 Floorstand measures 40-1/4"h, placing digital signage at eye level! 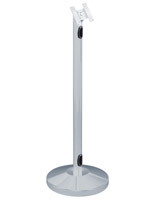 This tablet stand is VESA compatible, for use with various electronic devices instore. Current trends show Apple® iPad enclosures and interactive computers are becoming widespread, stretching far past personal use. 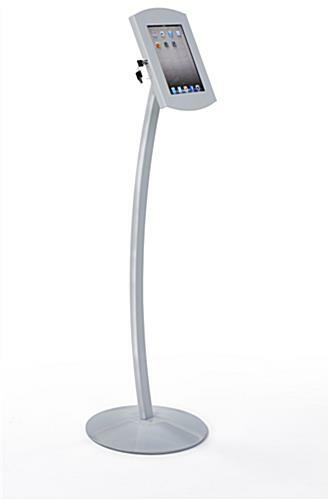 Businesses purchase this tablet stand, that includes a VESA bracket, to display digital signage and touchscreen devices within a retail location. 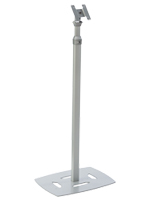 Universal floorstanding fixtures, such as the one seen here, feature a bracket designed for use with various electronics. Each VESA compatible tablet stand can be rotated, without having to remove your electronic devices from the upright. The universal mounting bracket also tilts 90°, for positioning your iPad at the right angle for optimal viewing. Glare will no longer be a hindrance when using this tablet stand. 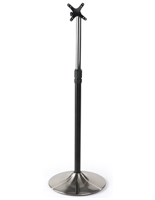 These floorstanding fixtures are crafted from quality materials to withstand extended use within indoor business settings. 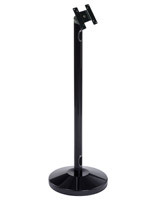 A tablet stand, that is made from metal, is durable and therefore ideal for retail advertising displays. These mounting accessories will also coordinate with any setting they are placed in. 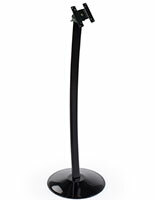 This mount for Apple iPad devices, silver tablet stand features a satin finish. The universal bracket included with this unit is designed for use with Apple® iPad enclosures, interactive Android devices and flat screen monitors (sold separately) with a specific hole pattern on the back. Digital photo frames and dynamic advertising monitors, with compatible mounting holes, can all be mounted to this universal tablet stand for iPad. Each fixture is sold without an electronic device, for users to mount previously purchased interactive touchscreens or flat screen monitors. Each tablet stand, that is sold separately, is designed for use with interactive devices and flat screen monitors with 75mm x 75mm or 100mm x 100mm mounting holes on the back.